Charitable institutions (like The Clinton Foundation), as Judge Jeanine Pirro has stated publicly, often serve as a slush fund for those whose name the institution bears. Pirro called the Clintons’ foundation nothing more than a “money laundering operation used as a slush fund.” Now, it seems, Senator John McCain (R-AZ) and his institution are coming under fire for contributions it has been receiving from the Rothschild family, a controversial global mining company, and the Royal Family of Saudi Arabia. Accusations of financial impropriety first arose back in 2008, when The Guardian first ran the story. McCain was traveling through the UK, and made a stop at London’s Spencer House, where Judicial Watch, noted Washington watchdog organization, objected to the fundraiser luncheon hosted by the Rothschilds. “The question is whether or not the Rothschilds paid for the event, the venue, the catering, or any other related costs,” asked Judicial Watch’s president Tom Fitton. McCain wasn’t successful in defeating President Obama in the election. 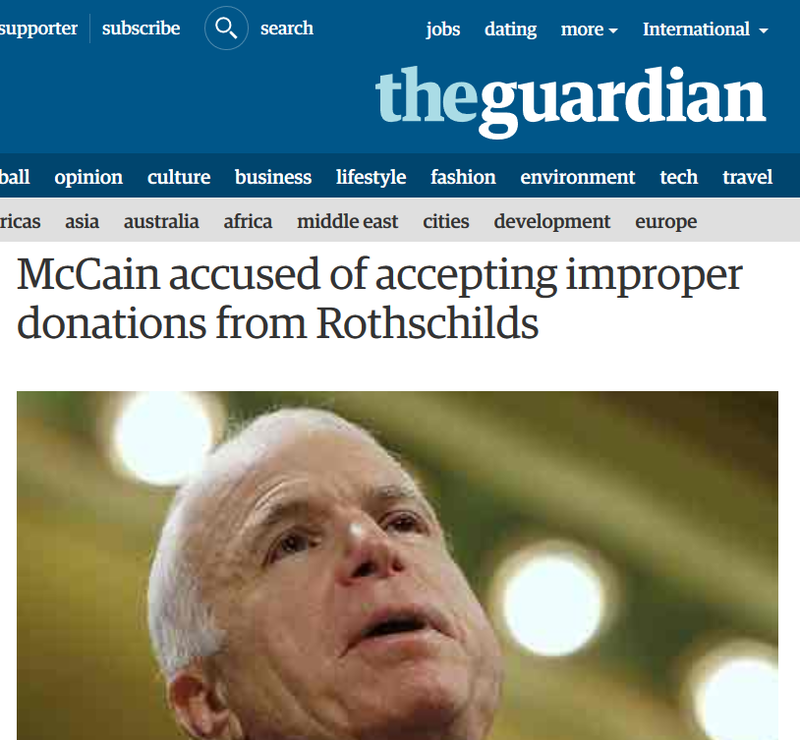 Yet while his campaign for president is a thing of the past, McCain’s ties to the Rothschilds and others is present day subject matter. Wikileaks has made certain the issue will not go away. 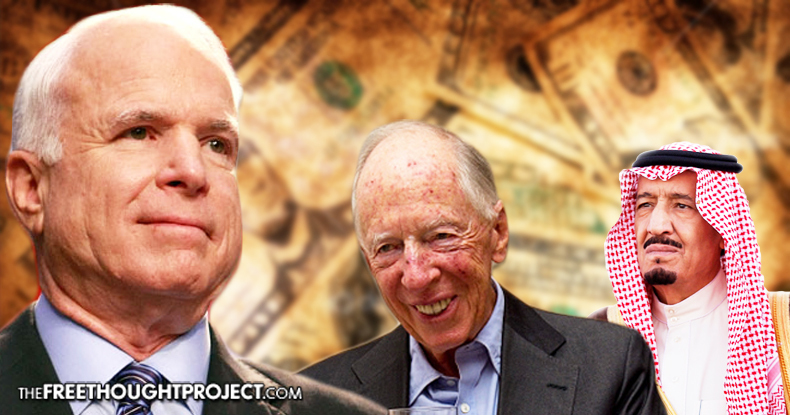 The organization committed to governmental transparency revealed just how close of a relationship McCain has with the Rothschilds. “Close Hillary Clinton friend Lynn Forester de Rothschild (Economist publisher) is a trustee of the Saudi-funded John McCain Institute,” Wikileaks’ tweet reads. And guess what. They’re right again. A quick check of the McCain Institute’s Board of Trustees finds a photo of Ms. Rothschild, as well as her bio. Since June 2002, Lady de Rothschild has been the Chief Executive of E.L. Rothschild LLC,a private investment company with investments in media, asset management, information technology, agriculture and real estate worldwide. Holdings include The Economist Group (UK), Bronfman/E.L.Rothschild, real estate and financial instruments. Lady de Rothschild has been a director of The Estee Lauder Companies since December 2000 and The Economist Newspaper Limited (member of the Audit Committee) since October 2002 . Also worth noting is the list of donors who’ve given $100,000 or more to the senator from Arizona’s institute hosted by Arizona State University. A quick glance reveals at least one branch of the Rothschild family is on the list. “The Eranda Rothschild Foundation – Sir Evelyn and Lynn Forester de Rothschild,” is listed on the institute’s website as a significant donor. Also listed as a donor is the highly controversial Phoenix-based mining company Freeport-McMoRan, whose gold and copper mining operations in West Papua, Indonesia are said to have brought poverty and genocide to the indigenous population. “Indigenous tribes such as the Kamoro and the Amungme claim their communities have been racked with poverty, disease, oppression and environmental degradation since the mine began operations in 1973,” writes The Guardian. Since the discovery of gold, and the alleged fraudulent handover of control to the Indonesian government in 1969, the country’s Muslim transmigration plan has resettled militant Muslims who have been systematically killing the Christian Kamoro and Amungme. The resulting genocide has been going on for nearly five decades with very little international attention given to the extermination taking place, often referred to as the “silent genocide”. Last, but certainly not least, in the list of controversial donors to The McCain Institute, is the Royal Embassy of Saudi Arabia. Yes. That’s right. The country with one of the worst human rights abuse records on the planet is a major donor to senator’s institute. According to Amnesty International, the country where it’s a crime to play a guitar in public, is one of the worst countries to live it one wishes to engage in life, liberty and the pursuit of happiness. The authorities severely curtailed the rights to freedom of expression, association and assembly, detaining and imprisoning critics, human rights defenders and minority rights activists on vaguely worded charges. Torture and other ill-treatment of detainees remained common, particularly during interrogation, and courts continued to accept torture-tainted “confessions” to convict defendants in unfair trials. Women faced discrimination in both law and practice and were inadequately protected against sexual and other violence. The authorities continued to arrest, detain and deport irregular migrants. Courts imposed many death sentences, including for non-violent crimes and against juvenile offenders; scores of executions were carried out. Coalition forces led by Saudi Arabia committed serious violations of international law, including war crimes, in Yemen. An unconfirmed document, found on IMGUR, reportedly shows the foundation, in 2014, received $1,000,000 from the Saudis and $300,000 from The Eranda Rothschild foundation. And while receiving funds, from organizations one might not agree with politically, is not a crime, keeping those funds may speak volumes about where Sen. McCain’s allegiances ultimately belong. One only has to think back to 2001, when the World Trade Center was destroyed, allegedly by Saudi terrorist hijackers, to remember when the New York mayor chose to give back funds he received and considered to be insulting. Rudi Giuliani gave back a check for 10 million dollars to the Saudi Royal Family, a gesture which drew bipartisan praise. Likewise, the Rothschild family reportedly controls half of the world’s banks. The elitist banking family who has made its fortunes creating paper currency, and lending money at high interest rates, crippling the U.S. economy is seen by many as an enemy of the people. Former U.S. Congressman Ron Paul once said they help control the Federal Reserve, and hand-select all appointments to government committee positions. But it’s still anyone’s guess if the Rothschilds’ man in Washington is John McCain. At any rate, he doesn’t seem to have a litmus test as to from whom he will receive money.